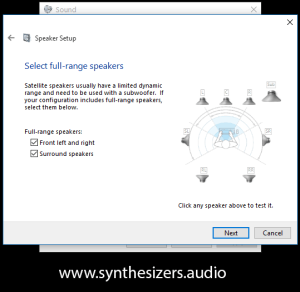 Windows 10 is very easy to configure for multichannel surround audio providing you have a surround capable audio card/interface and speaker system. This should also work on earlier versions of Windows OS as well. 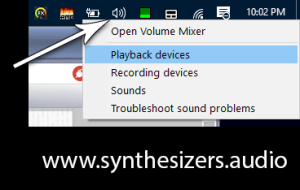 Right click the speaker icon on your taskbar and select ‘Playback devices’. 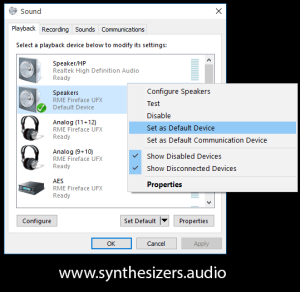 Right click the ‘Speakers’ listing of your sound card/interface (mine is an RME Fireface UFX interface) and set it as the default device. Click ‘apply’ and a green tick should then show over the icon. 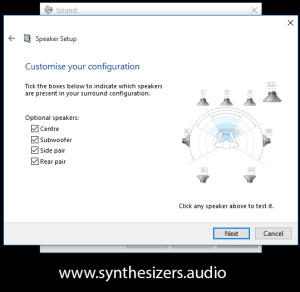 Right click the speaker icon again and then left click ‘Configure speakers’. Select the setup that matches your interface and speakers. I have 7.1 selected here but the most common configuration is 5.1. Click the ‘Test’ button and you should hear sounds played from each speaker one at a time with an animation over the currently sounding speaker. If all is well, click ‘Next’. Tick all the boxes corresponding to the speakers you have (again, this grab shows my 7.1 setup). Click ‘Next’. Tick each box corresponding to large, full range speakers and leave unticked each box corresponding to small, limited bass response speakers. This step is important. If you are running large speakers, they will produce the full bass range for those channels if the boxes are ticked. Otherwise, they will produce limited bass and the lower bass range will be redirected to the subwoofer. Click ‘Next’ and then ‘Finished’ and your system should now play back the 5.1 FLAC and 5.1 AC3 (Dolby Digital) files on Synthesizers.Audio (and any other discreet surround media you have) in full, discreet surround sound. Check out the Multichannel Audio page for FLAC and AC3 5.1 audio downloads. Hi I have a problem here. I’m playing with 8 channels. But it seems that my computer only recognize 4 of them. How can i configure it? Thanks! Apologies for the delayed reply Calvina. I have recently done a site upgrade and noticed some missed comments and yours was one of them. Did you get this issue resolved? If not, what audio hardware are you running with your computer?